Breitenbush Hotsprings is a retreat center two-plus hours outside of Portland where Garth and I and our kids have gone since Kami was barely walking. We have likely gone more than 30 times in the past 13 years, usually as a family, occasionally in ones, twos or threes. This past Wednesday, I spontaneously decided to take Luken for an overnight. There were 60 or 70 people there at the same time we were. 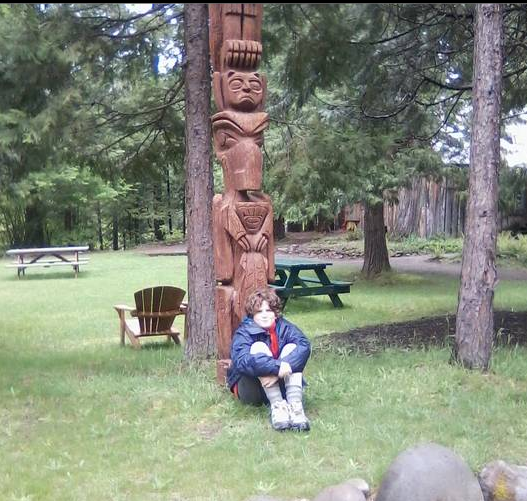 Walking into the grounds, Luken remembered one of our rituals and asked to be photographed in front of the totem pole. When we arrived around 4:00 in the afternoon, it was cold enough that I left a quart of milk outside our cabin on the stoop rather than bringing it to the lodge refrigerator. Within the hour, someone had taken it. This is so unusual in this place that it takes my breath away. After dinner the first day, Luken and I visit the Sulfur God. Many years ago, this was the name we gave to an almost hundred-year-old kiosk-like thing that was built atop sulfur-smelling hot water that issued forth from the ground. We must have thought it looked something like a structure that would have been built to house an oracle. As Luken and I leap the stream we have to cross to get there, Luken remembers the time we found a bright orange crawdad in the water. This time, we find an earthworm. It is bloated and gray. I don’t exactly understand how slow-crawling creatures come to fall into these low pools of terribly hot water, but it cooks them right away when they do. After breakfast, Luken and I go on the Bridge Walk. It is the beginning of one of the Gorge trails and we call it thus because of the many small bridges involved in following the trail. Luken talks about airplanes and about the memoir we are reading about Roald Dahl’s time in the RAF during WWII. It is gripping, and we return again and again to certain parts: “Can you believe his commanding officer sent him to the wrong coordinates? Can you believe he was asked to engage German bombers in an airplane he’d only flown for a total of seven hours?” In between airplane talk, I say, “That’s a ladyslipper; your Bumpa used to always point those out. This is a mountain strawberry. These will have huckleberries on them in a couple months.” Luken says, “Oh, oxalis!” We each pick a couple and chew on them, our salivary glands cramping from the tartness. At lunch, at a table adjacent to us, a woman says, “It’s amazing the variety you can get just cooking in a vegetarian manner. I was kind of worried about that, to tell you the truth.” She and her table-mates are here for a workshop of some sort – one on dreams, or one on Living the Embodied Life, which are the two being offered – and I think to myself, This is how it happens: people come up here for a workshop they want, and their comfort is stretched just a little, and they learn the world isn’t quite the way they thought previously. It is larger with more possibilities. Wherever we walk, there are enormous trees. Mountain rhododendron sprawl here and there, some of them sporting two-toned open blossoms of hot pink and magenta and others tight, flame-shaped buds. It is always hard to leave, and most especially when one has been for less than 24 hours. Unless you are a 12-year-old boy who misses his dad after a day. The gravel road is rutted on the way out. For a number of years, someone made a shrine by the side of the road of all the hub caps that were liberated by those ruts. It’s not here now, and I miss it. yay, found it! attached! crazy transformer robot toys from Indonesia!! !